TRANSFORM YOURSELF AND YOUR CULTURE. What is the Art of Convening Training? A practical field-guide is the companion text for each training. Purpose + Presence = Impact. Convening creates a structure to connect to your purpose and be in authentic relationship with others. Convening is a core practice for purposeful leadership. Purpose shared is great leadership: Great leadership is intentional. At the heart of the matter is purpose. Consider every meeting or conversation an opportunity for maximum engagement, not just another calendar appointment by bringing your purpose into play. Art of Convening Trainings are founded on a practical methodology that builds and expands your personal resilience, emotional intelligence, and leadership capacity. Convening trainings are real-time examples of how to practice and apply this powerful yet simple structure. Bring your conversations or meetings to the next level of greatness. AoC trainings focus on whole-person, purposeful leadership in real-time application, and the power of creating an intentional engagement strategy for yourself and those you lead. Connect to lead: Brain science shows that your meeting performance and outcomes can be significantly different when you take time to connect, even in the simplest of ways. Convening is a path to relationships within systems and a technology that takes the potential in each person and amplifies it. It's a multiplier. Of relationships, of impact. 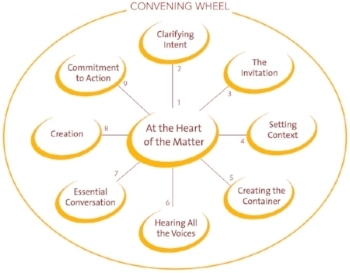 The foundation of each Art of Convening Training is designed from the principles, practices and applications of the 9 Aspects of the Convening Wheel, a methodology for transforming any meeting or conversation from ordinary to inspired. Who is the Art of Convening for? Whether you lead from the front or from within, the AoC Training will equip you with tools to make a difference in any meeting or conversation. Poking fun at meetings is the stuff of Dilbert cartoons—we can all joke about how soul-sucking and painful they are. But that pain has real consequences for teams and organizations. Do you feel that meetings are a waste of time, boring, people don’t mean what they say, or you think “am I really needed”? A loss of time, momentum and productivity? If so, the AoC training is for you. If you want to be truly effective & engaged, inspired with high expectation to produce outrageous outcomes. You know in your heart that collaborating with others could be more productive, even fun and have lasting results, but don’t know how to get started. Then the AoC Training is for you. √ ICF CCEs: students who participate fully in each aspect of program (either in-person or virtually) will be able to receive Continuing Coach Education credits for an additional fee. "CPL helped me use the Art of Convening to plan an important series of meetings that were much more successful as a result. I received feedback from participants that these meetings were among the most effective they’d ever experienced, and it was clear to me that they resulted in productive outcomes and very positive energy. The Art of Convening works, and CPL is a valuable partner!" "I came away from The Art of Convening Training (AoC) more energized, focused and ready to forge ahead with an appreciation of what was missing in our traditional approach to holding meetings. We have implemented the AoC within our organization and using the convening principles are gaining greater/deeper participation and collaboration in our meetings." Convening is different from facilitation. By definition, facilitation is ‘the process of making things easy or easier.’ Conveners invite participants to co-create the highest possible outcome for a meeting or gathering. 2. To act and share. Purpose is compassion in action. The Art of Convening has had a truly positive impact on my entire team and I am already seeing the results in our workplace.